"Generally, transcription factors are used to try to increase or decrease the cell reprogramming process. We have discovered that we can increase the efficiency of the process by inhibiting the Wnt route," explains Dr. Francesco Aulicino. Now, researchers at the Centre for Genomic Regulation (CRG) in Barcelona have taken a very important step towards understanding cell reprogramming and its efficiency: they have discovered the key role of the Wnt signaling pathway in transforming adult cells into iPS cells. "Generally, transcription factors are used to try to increase or decrease the cell reprogramming process. We have discovered that we can increase the efficiency of the process by inhibiting the Wnt route," explains Francesco Aulicino, a PhD student in the Reprogramming and Regeneration group, led by Maria Pia Cosma and co-author of the study. The researchers have studied how the Wnt route behaves throughout the entire process of transforming cells into iPS cells, which usually lasts 2 weeks. It is a very dynamic process that produces oscillations from the pathway, which is not active all the time. "We have seen that there are two phases and that in each one of them, Wnt fulfils a different function. And we have shown that by inhibiting it at the beginning of the process and activating it at the end we can increase the efficiency of reprogramming and obtain a larger number of pluripotent cells," indicates Ilda Theka, also a PhD student in Pia Cosma’s group and a co-author of the article. To artificially control the pathway, the group has employed a Wnt secretion inhibitor, Iwp2, which does not permanently alter the cells, something which other research into reprogramming using different factors has still has not been able to acheive. They have also seen that the exact moment when the Wnt pathway is activated is crucial. Doing it too early, makes the cells begin to differentiate, for example into neurons or endodermal cells, and they are not reprogrammed. "It is a very important and an innovative advance in the field of cell reprogramming, because until now this was a very inefficient process. There are many groups trying to understand the mechanism by which adult cells become pluripotent, and what blocks that process and makes only a small percentage of cells end up being reprogrammed. We are providing information on why it happens," says Theka. The work opens the way to new advances in regenerative medicine and sheds light on certain types of tumors involving the Wnt pathway. Other labs are also working on ways to increase efficiency when inducing pluripotency in these cells. This is the case of the Haematopoietic Stem Cells, Transdifferentiation and Reprogramming laboratory, led by Thomas Graf, where they work on induced plurioptent stem cells (iPS). 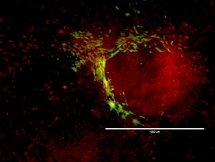 Illustration: Cells with activated Wnt can no longer be reprogrammed (in green) are located on the periphery; cells that can be reprogrammed are aggregated and can be seen in the center of the image (in red). –Center for Genomic Regulation.